Shirts are designs from Urban Threads sewn without scroll background. I was pushing the stitch count as it was. The shirts are very thin, lightweight knit. Thank you. Those designs called my name last year also but didn't get around to using them until these shirts. I'm thinking table runner for the full design with swirls? I'll have to see what happens next year. You GD looks very happy! 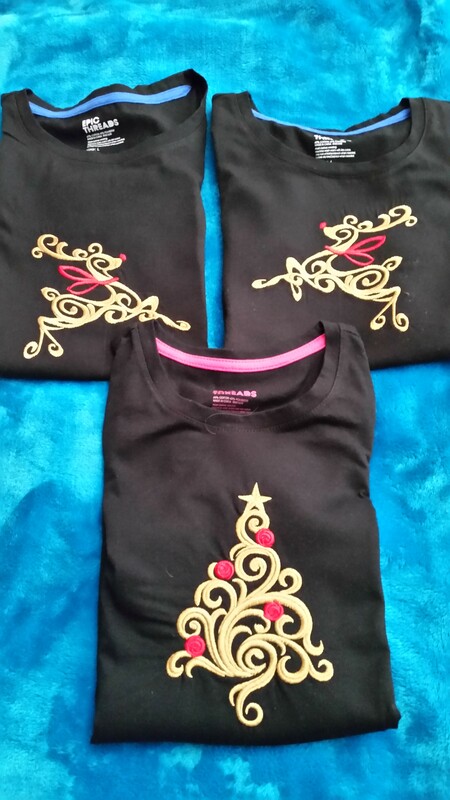 You have done a wonderful job on the shirts also! Thank you. My two local grands have already grabbed them and are wearing them. Hope they last for pics. Wow, your grand is beautiful, adorable, and obviously thrilled to get her quilt. The shirts are fab too. Well done, Grandma. Thanks. The shirts were a challenge. They are way too flimsy. What a cute little granddaughter! The quilt looks lovely and I love the gold on the black with your t-shirts. They came out very nice! Thank you. It's always fun to make something for her. Lovely work, your grand looks very happy with her gift. She is a cutie. Sandra. Doesn't it just fill your heart to bursting when something you've made is so wonderfully received! Can't wait until they arrive for the holidays! Thanks for looking. Thanks for your kind words. She fills the room with happiness. I have a granddaughter who loves bugs too. I recognized some of those fabrics from my stash. Good looking tees. I love your choice of black to show off the designs. Thank you. Black is always my go to for framing. Thank you. The shirts will be worn for family pictures. We only get everyone together(East Coast and West) for holiday pics every 2 years. What a difference in the grands when comparing previous to current! Adorable little one . Great stitching. Thank you. They were fun to do. What an Happy face!!! !Gorgeous work done!!! Thank you. Like all of us when looking at our own work I see a few questionable spots but I so appreciate your "gorgeous work" comment. 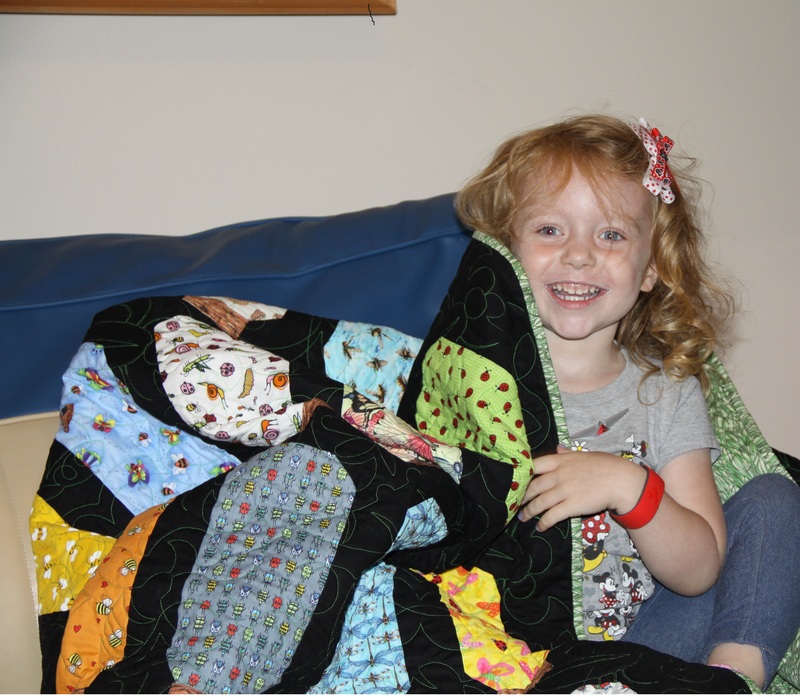 What a Happy Girl... she has good eyes... spots the quilts like my grand daughter did.. Thanks, always rewarding when they are so excited to receive our projects! What an adorable photo of her! That's quite an assortment of bug fabric you have there. I'm a quilter at heart and always enjoy seeing them. The tshirts are great! Seems to me that all tshirts are thin now a days and difficult to stitch on. Seems that you got the stabilizer just right on these. Nicely done! Thank you. The bugs were collected over a few years - a remnant here, a remnant there. Finally had enough to give it a go. Now that's a true quilter for you! Saving a little bit of fabric here and there and turning them into a fabulous quilt!